Improper shipping of hazardous chemicals can have disastrous consequences. It takes an enormous level of care and expertise to ensure chemicals make it from Point A to Point B without issue. A vast web of regulations reflects the unique challenges posed by chemical logistics, and it is incumbent on the shipping company to adhere to them and — in many cases — go beyond them. Below, read about the dangers unique to chemical logistics, as well as some of the strategies used to ensure that products safely make their way through the transport process. -	Security. Any logistics company faces security issues, but none are quite as extreme as in the chemical industry. Regulations for chemical transportation are incredibly strict and became more so in the aftermath of 9/11. Both the U.S. Department of Homeland Security and the U.S. Drug Enforcement Agency regard chemicals as controlled substances and, as such, impose tight restrictions on how they can be transported. Part of the reason is the risk of chemicals falling into the wrong hands and potentially being used as weapons. -	Fatigued drivers. Driver shortages impact all logistics companies, but the risk is greater for chemical transport. 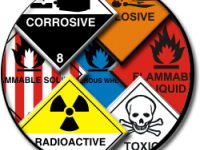 The risk of an accident is greater when hazardous materials are involved. For that reason, a logistics company must be extra mindful when it comes to the number of drivers available and the strain they might be put under. -	Faulty equipment. It’s absolutely crucial that a vehicle transporting hazardous chemicals be thoroughly examined for any flaws or malfunctions. Faulty equipment can run the gamut from leaky tanks to an engine that won’t quite cut it during a long haul. -	Improper labeling. As chemicals are being moved from location to location, mislabeling is a real risk. The risk of sending the wrong chemical further down the supply chain can be significant — and not just in terms of confusion upon destination. The wrong chemical in the wrong storage container can be deadly. More on that in the next point. -	Improper storage. Chemicals react differently to different factors. Chemical reactions are the most obvious hazard, but there are also storage risks. Certain containers are better suited to house specific chemicals for reasons related to corrosion over a long trip. Then, there is the issue of how the chemicals move due to viscosity and density. A denser liquid might jostle a vehicle during an unexpected stop, causing it to lose control. For those types of chemicals, smaller compartments are necessary. Such intricate considerations must be made at every level, depending on each chemical being transported. -	Dangers on the road. Some hazards are the same across the board, and those existing on the road are just one example. However, it is imperative that chemical logistics companies be even more mindful of these types of hazards. A major pothole might cause another shipping vehicle to fishtail, but that same accident can quickly become catastrophic if chemicals are involved. -	Training. First and foremost, any employee who touches chemicals — from storage to transport — must be specifically trained to do so. They should understand the risks, the regulations and the extra steps required to prevent an accident. -	Testing. Along those same lines, it’s crucial for a logistics company to keep its drivers on their toes. Many companies will do routine surveys and testing to ensure drivers are up to date on all rules and regulations. -	Equipment. From padding and static guards to special EE-rated non-spark devices, the right equipment is crucial to prevent a chemical explosion or spill. Transport trucks must be specially fitted to carry any given chemical. -	Storage. Like the trucks that move them, the warehouses that store chemicals must be specially controlled. Different hazard classes, including flammables, corrosives and more, have to be stored in different ways. With the right balance of chemical knowledge and safety training, chemical logistics companies can ensure that employees and the general public are well protected from dangerous accidents. Lynn Place has 30 years’ professional experience in the manufacturing, market research and advertising industries. As the Vice President of Marketing for SolvChem Custom Packaging Division, Lynn specializes in consumer packaged goods, new product development and strategic planning.